Explore New Zealand's North Island with its unique 7 unique geographical regions and diverse natural beauty, from soaring mountain peaks, fiords, lakes, rivers, native rugged bush, the majestic volcanoes of the North Island's central plateau to the central North Island skifields of Whakapapa and Turoa by bus and coach from Napier. Napier (Pop: 61,1o0) is a port city in Hawke's Bay, New Zealand. Less than twenty kilometres separate the centres of Hastings city and Napier, and the two are often called "The Twin Cities" or "The Bay Cities". The city is 320 kilometres (by road) north-east of the capital, Wellington and 143 kms south west of Taupo. It has a population slightly smaller than the Hastings District, but as Hastings is administered as a district, Napier is the only official city in the Hawke's Bay region. Napier is the largest cross-bred wool centre in the Southern Hemisphere and is the export servicing area for Hastings District which is one of the largest apple, pear and stone fruit producing areas in New Zealand. It has also become an important grape growing and wine production area with the fruit passing from the growers around Metropolitan Hastings and then to Napier for exporting. Large tonnages of frozen meat, wool, pulp and timber pass through Napier’s port. Napier is a popular tourist city, with a unique concentration of 1930s Art Deco architecture. It also has one of the most photographed tourist attractions in the country, a statue on Marine Parade called Pania of the Reef. 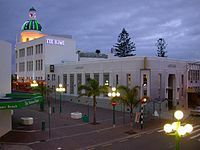 Thousands of people flock to Napier every February for the Art Deco Weekend event, a celebration of its Art Deco heritage and history. Other notable tourist events attracting many outsiders include the region's annual Wine & Food Festival (named Harvest Hawke's Bay), and Mission Concert at the Mission Estate Winery in the near by town of Taradale. In February for Art Deco weekend and the Mission Concert Weekend, which has featured Chris De Berg, Olivia Newton-John, Eric Clapton, Kenny Rogers, Ray Charles and Rod Stewart. Attractions nearby in the Hastings District include the Cape Kidnappers Gannet Colony and many vineyards bordering Hastings City. The large wine industry hosts the Annual Harvest Hawkes Bay Weekend. Travelling from Napier is in modern buses and coaches with InterCity Coachlines operating a fleet of eco-friendly air conditioned buses with reclining seats and foot rests. Great Sights and Newmans Coachlines operate premier services using a fleet of modern eco-friendly air conditioned coaches featuring reclining seats with foot and head rests and onboard toilet/washroom facilities. If you want to explore and see New Zealand's unique scenic beauty from Napier, there are a range of flexible 'Book As You Go' bus, scenic coach, ferry travel and sightseeing passes giving you value for money travel.